Edited to add: The 12 UTC forecasts from the WRF model are considerably different than those at 06 UTC, and they now forecast more storm activity in Pima County. Watch for Mike's discussion. WRF forecasts for Pima County yesterday were quite good, as only very isolated showers occurred. The above, from Maricopa County FCD, shows gauge adjusted radar rainfall estimates for 24-hours ending at 6:00 am MST this morning. Graphic below shows flash density for detected CGs for 24-hours ending at 7:00 am this morning (from weather.graphics and Vaisala) - with thunderstorms staying mostly over higher terrain to the north. One ALERT site in Oro Valley measured 0.12" and that was only gauge with rainfall. This morning's skewT plot (from SPC) of the upper-air data from TWC is little changed from yesterday. Easterlies are deeper and upper tropospheric winds are lighter. At 500 mb the trough/shear zone between the anticyclonic centers (now over northeastern Utah and southeastern Oklahoma) has inched westward a bit, while an upper-tropospheric vorticity maximum pulls northeastward from northern Mexico heading toward New Mexico. The 06 UTC forecasts from the WRF-NAM (and also the GFS version) indicate little shower or storm activity today for southeastern Arizona, except along the border with New Mexico. Although, the models forecast PW to increase during the day, this is countered in the forecasts by middle-level warming - above WRF-NAM forecast of 500 mb wind and temperature is valid at 2:00 pm, with forecast temperatures around -5C or warmer. The forecast skewT for TWC valid at 2:00 pm (below) has 33 mm of PW but almost no CAPE. The most active weather remains down in the tropics. Hurricane Lester is a Cat 4 storm this morning, while weakening Hurricane Madeline will brush the Big Island later today and tonight. The NHC expects TD Nine (currently over the GoM) to strengthen into a TS today (Hermine) and make landfall tomorrow night over northern Florida, with winds of around 50 mph. However, in a CYA mode the NHC has also issued a hurricane watch for northern Florida. Suppressed conditions continue over the West on our side of the Continental Divide - above (from weather.graphics and Vaisala) is 24-hour CG flash density ending at 7:00 am this morning. The lack of thunderstorm activity is somewhat amazing. This morning more moist air has pushed in with higher pressures and easterly winds from New Mexico. It was a very warm morning with easterly, downslope winds along the Rillito. The morning sounding's skewT plot (above from SPC) shows PW now above an inch, with a moist, well-mixed layer below 850 mb. The troposphere continues to be split between between a deep surface layer that extends almost to 500 mb and an upper half with west to northwest wind flow and a warm layer centered just above 500 mb. At 500 mb there are two distinct anticyclone centers - one over the Great Basin and another far to the east over Arkansas. The trough/shear line separating these centers is over the Arizona - New Mexico border this morning, which leaves the middle-level flow light and variable. All-in-all a fairly mundane sounding, with slight CAPE at lower elevations. The WRF forecast model runs from Atmo at 06 UTC mirror the mundane morning conditions with a forecast of at best isolated thunderstorms over Pima County this afternoon. The skewT above is from the WRF-NAM and is valid at 5:00 pm MST. Mixed layer CAPE for this sounding is only 87 J/Kg and PW is 26 mm. The warm air at mid-levels limits CAPE and there is little steering flow. The model's forecast of composite radar echoes valid at 4:00 pm below reflects the lackadaisical synoptic setting with its forecast of very isolated storms across southeast Arizona. Photo above from neighbor John Ferner was taken recently in Saratoga, Wyoming. Saratoga is in southeast Wyoming along the North Platte River, west of Cheyenne. I am well aware of how the wind blows in Cheyenne. When I was sent to graduate school by the USAF at Colorado State University in the early 1970s, I had to do all my official USAF business up at F. E. Warren AFB in Cheyenne. Compared to Ft. Collins it was a different and very windy world up there. I figure the frequent blowing dust usually settled out around Omaha or east. The Southwest continues quiet on our side of the Continental Divide. Plot above shows detected CG flashes during past 24-hours (from Atmo and Vaisala) - have to look very closely to find any. 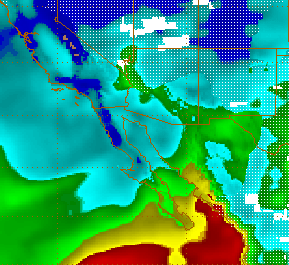 Graphic below is from 00 UTC forecast run at Atmo of the WRF-GFS on the 5.4 km grid. Forecast is of accumulated rainfall through midnight on August 31st - pretty grim except for parts of Cochise County and Sky Islands around Tucson. Great morning for walking along the Rillito, with very comfortable, cool temperatures. Not a cloud in sight above looking south from Kitt Peak. The series of T and Td below shows the rapid drop in dewpoints yesterday afternoon at Atmo - Td got as low as 32F - quite something for August. 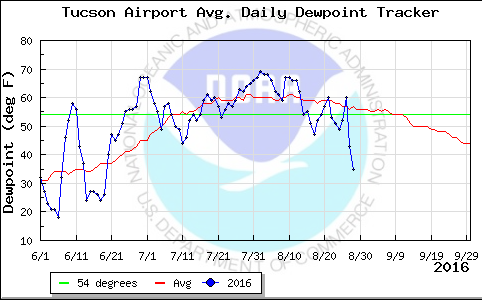 The Td series from TUS, second below, indicates that this is the greatest dry departure from average Td since June began. Plot of detected CGs above (from Atmo and Vaisala) is for 12-hour period ending at midnight last night, showing almost no thunderstorm activity west of the Continental Divide - again fairly remarkable for August. The tropics remain active - outlook below from NHC is for the Atlantic - the two western disturbances may threaten US mainland during next couple of days. Meanwhile, Hurricane Lester continues westward out in the Pacific. The 12 UTC WRF forecasts played out pretty well yesterday, with storms and rain around parts of the greater metro area but much of core city area remaining dry. Here at house we were dry after the pre-sunrise shower but did have a strong outflow from storms over toward the northeast part of the metro. 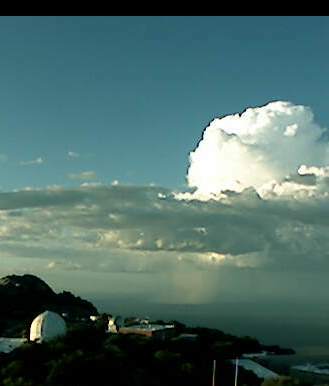 Image above shows storm with nice rain shaft to north-northeast of Kitt Peak at 6:25 pm MST yesterday. Graphic below is gauge-adjusted radar rainfall estimate from Maricopa County flood control district for 24-hours ending at 6:00 am this morning. This morning very dry air is swinging around the 500 mb short wave that is over the Lower Colorado Basin - as was also predicted well by yesterday's WRF forecasts. Graphic above is the blended PW analysis from CIRA at Colorado State University for 11 UTC this morning. PW has already fallen below an inch over much of south and southwest Arizona. The dry-out pushes north and eastward during the day - 06 UTC WRF NAM forecast of PW below is valid at 5:00 pm this evening. Both WRF models from 06 UTC forecast showers only along the eastern edge of Cochise County across the southern third of Arizona - a serious downturn relative to yesterday. The WRF NAM forecast of total rainfall at bottom below is valid at midnight tonight. By early next week, higher PW air will try to push westward from New Mexico back into southeast Arizona, after a dry and warm to hot weekend. Light showers across parts of area occurred between about 3:00 and 4:00 am MST. There was 0.08" here at house at sunrise, and visible satellite image (above from 7:00 am) shows considerable cloudiness across much of central and southern Arizona. Rainfall data from the ALERT network (below for 6-hours ending at 7:00 am) indicates light rainfall measured at 5 sites. Storms and rainfall yesterday afternoon generally hung over the mountains. The morning sounding (above from SPC) skewT plot has PW up to 1.41 inches and CAPE values around 750 J/Kg. The PW across southern third of Arizona is generally running about 1.00 to 1.50 inches. The winds are westerly above 500 mb and steering flow is indistinct - although, WRF forecasts trend toward westerlies through the CAPE layer this afternoon, which is not a very good steering flow for storms in the metro area. West winds at upper-levels will produce some anvil shading ahead of storm cells, which could lead to erratic propagation toward pockets of more unstable air. Generally a so so transition-type situation - current morning POPs from NWS for airport grid are 30% today and 40% tonight. The WRF forecasts from 00 and 06 UTC runs were not very consistent; however, the 00 UTC WRF-NAM appeared best for the early morning showers. This morning's 12 UTC forecast from NWS NAM model (forecast below for 500 mb valid at 5:00 pm MST tomorrow afternoon) indicates a short-wave breaking off of the Great Basin trough and moving across Arizona Saturday night and Sunday - continuing the Fall-like pattern. There were thunderstorms over northern and far southeastern Arizona - as the plot of CG flash density for 24-hours ending at 7:30 am MST tis morning (from weather.graphics and Vaisala). Some storms and gusty winds made it out into lower elevations of eastern Maricopa County, bring parts of Phoenix area thunder and gusty winds. 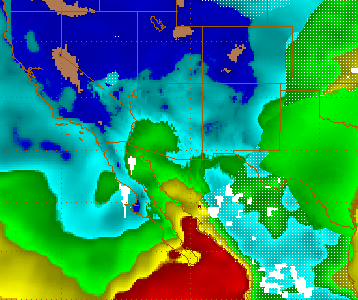 Precipitable water continues holding on at values of an inch to an inch and a half over portions of southern Arizona (CIRA blended PW analysis above is from 6:00 am this morning). Here at Tucson, as per morning sounding below, PW has crept up to just over an inch and there is a bit of CAPE at low elevations. Only winds of significance are above 500 mb. At 500 mb a trough from southern Canada into the Great Basin is having increasing influence over the Southwest and will dominate the large-scale pattern for next few days (chart below is NAM forecast valid at 5:00 pm this afternoon). So depending upon PW and CAPE evolution, there may be a chance for storms in our area on Friday and Saturday from this transition type setting. Both WRF forecast runs from 06 UTC suggest isolated storms over the nearby mountains later today. since it has some interesting content, as opposed to mini-discussion from Tucson. 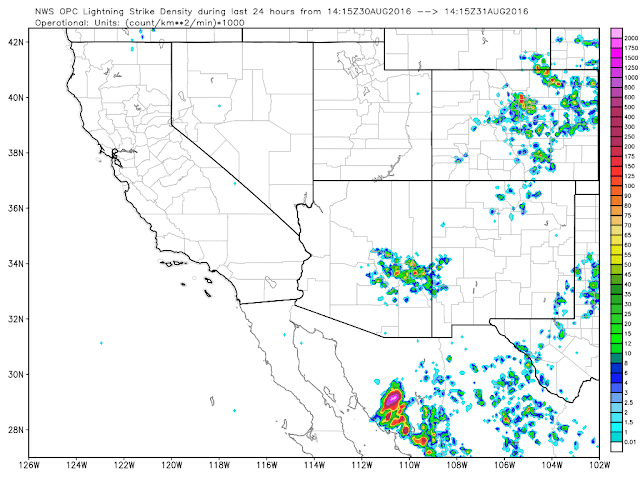 Another day yesterday with no thunderstorm activity across the southern third of Arizona, as per detected CG flashes for past 24-hours, through 5:00 am MST this morning (above from Atmo and Vaisala). However, the tropics of both the Atlantic and Pacific Basins are quite active. 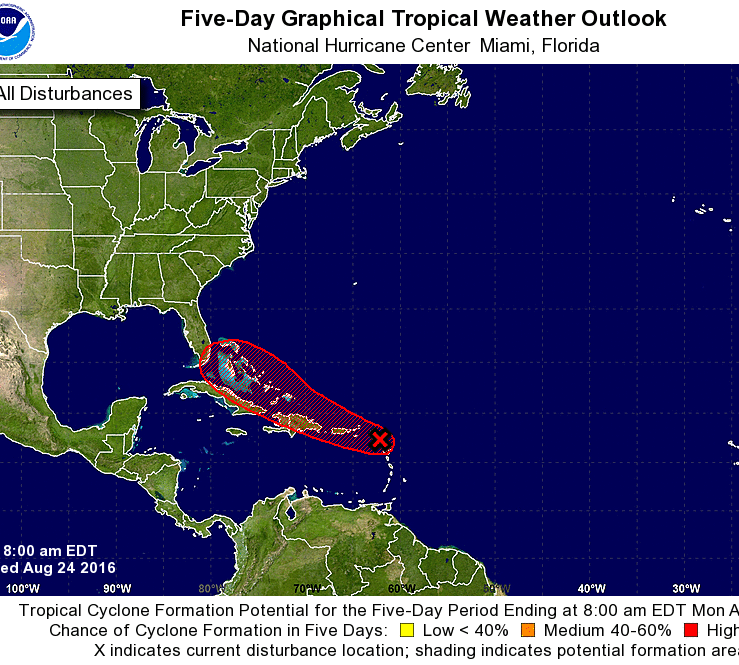 The five day outlook (below) from NHC this morning indicates a tropical system threatening Florida by the weekend. 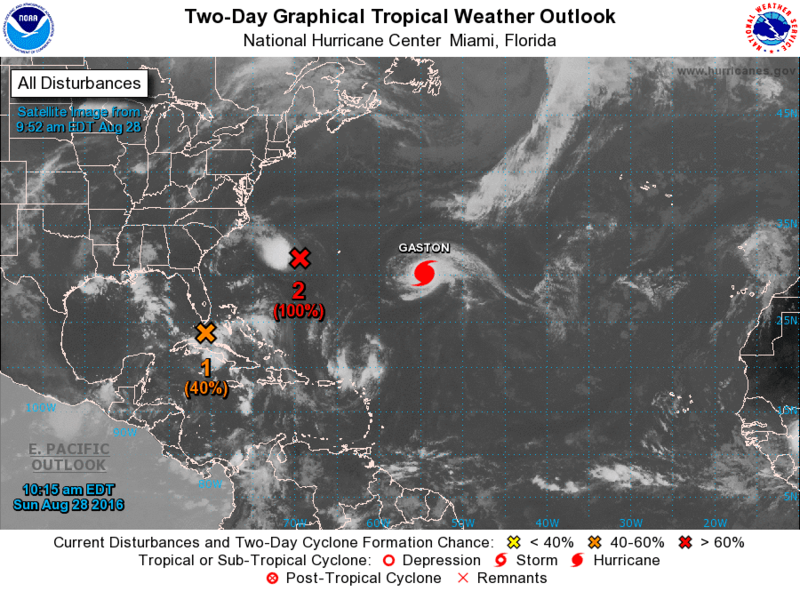 Hurricane Gaston appears likely to remain over the open Atlantic. The long-term forecasts from the operational versions of the GFS (above) and the ECMWF (below) are quite different at 168-hours (both surface forecasts valid at 00 UTC on August 31st). The GFS is picking up on only Hurricane Gaston, while the ECMWF is forecasting three other tropical storms/hurricanes by the end of the month. The big, and potentially important difference is over Florida and the Gulf of Mexico. The ECMWF would bring a storm and potentially more heavy, flooding rains to Louisiana and Texas. Certainly an interesting situation to watch as the month draws to a close. Another nice sunrise this morning - one of many this summer. 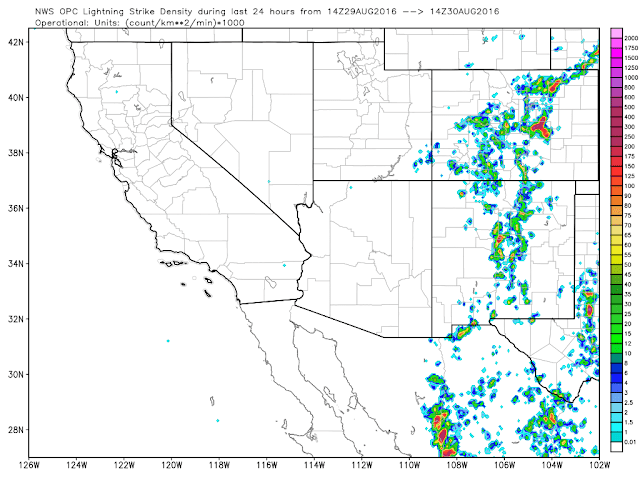 Southeastern Arizona totally suppressed with respect to thunderstorms yesterday. Trough in westerlies dominates next several days, with dry and stable conditions southern third of the state. Note - nice aerial photo of a Phoenix Haboob on Jim Steenburgh's blog this morning - link to right. Ron Holle shot the above photo of a microburst on Saturday evening (August 20th) a bit before 7:00 pm MST (time corrected). He was looking south from the Desert Museum and estimated surface winds of 40 to 50 mph, based on the blowing dust. Fair coverage of rainfall yesterday brought thunder and gusty winds of 30+ mph here at house, but only 0.01". The ALERT network reports for 24-hours ending at 7:00 am above indicates 32 sites with rainfall - most of these were in the southern half of the network, where the areal coverage was very high. Radar/gauge rainfall from Maricopa County Flood Control for same period below fits the observations quite well. Plot of CG flashes (from Atmo and Vaisala) is at bottom, showing that the metro area was mostly devoid of storms, except for the cells across I-10 just out west of here. Slow dry-out continues and WRF models forecast only very isolated mountain storms for southeast Arizona next several days, as Fall-like pattern continues. I feel beat up after last 5 marginal storm days here in southeastern Arizona. Yesterday there were more storms around, but also lots of anvil shading with storms hugging higher elevations. The 06z WRF forecasts yesterday both tended toward too much storm activity in Pima County, although the NAM version was definitely more conservative than was the GFS version. The 24-hour rainfall map below (radar estimates adjusted by gauge data) is from Maricopa County Flood Control. It shows that most storm and rainfall activity at lower elevations was out along the Colorado River. There were several severe thunderstorms in central and western Arizona. Not much has changed today, except that MCS activity has helped spin-up a distinct MCV-type circulation that is moving northwestward over the lower Colorado River Basin. The 06 UTC WRF-NAM forecast of composite radar (2nd below) is valid at 1 pm MST today and is as active as the model forecasts for eastern Pima County. The dismal large-scale pattern continues, with a westerly trough dominating the upper half of the troposphere over the Southwest - has been like this much of the month and begs the question of when did the deep monsoon pattern vanish? Several 300 mb charts are shown here - top 00 UTC on 9 August; just above 12 UTC this morning; bottom GFS forecast for 00 UTC 28 August. Argh - will a deep monsoonal pattern return at all this summer? So much for early storms on the mountains (visible image above from 11:45 am MST) - what else will go wrong? However, it does look like an early storm over/near Art Douglas' place in Ash Creek Canyon. Another nice sunrise thanks to cumulus and some buildups drifting around the morning sky. The unusual summer 500 mb pattern continues, with an anticyclonic circulation center off in northern California and another somewhere down in central Mexico (12 UTC analysis above from NCAR RAL/RAP). A weak trough line lies across southern Arizona. Certainly not a typical monsoon pattern and one without significant features to track. The stronger northeasterly winds over northern Arizona will try to move storms toward the lower Colorado Basin; a situation favorable for severe thunderstorms out there. Locally, our morning sounding (skewT plot from SPC) above is more moist and definitely more unstable than was yesterday's. Winds in the lower troposphere are becoming light and variable again, increasing chances for local heavy rains and perhaps wet downbursts. There is also CAPE aloft from about 800 mb up to 600 mb, so earlier thunderstorm activity over the nearby mountains should be likely today. The 06 UTC WRF forecasts from Atmo have a split personality for this afternoon. The WRF-NAM forecasts only isolated storms over eastern Pima County and keeps stronger storms off to south and southwest. However, the WRF-GFS forecasts a very active day for much of the state (forecast of composite radar echoes below valid at 4:00 pm), with very strong outflow winds over about the southwestern third of Arizona. Appears that today will be much more interesting than was yesterday. Summary Of Summer Here and Misc.